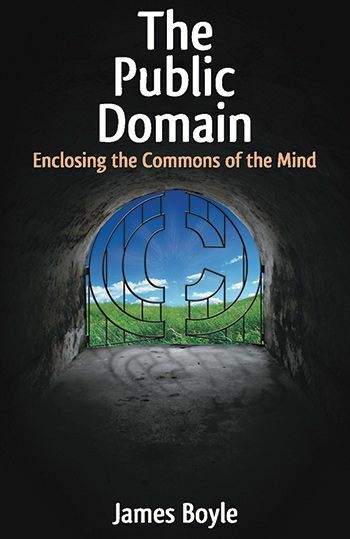 James Boyle’s book “The public domain: enclosing the commons of the mind” is an extremely thoughtful, carefully written account of a major issue. The issue is that a very powerful and useful resource is, largely unwittingly, being deeply damaged by people following actions that on the surface seem to make sense. The resource in question can be called “the public domain”. It’s the general set of ideas, designs, and artforms which we can all build on, to create yet new ideas, designs, and artforms. Everyone who writes a book or blog article, draws a picture, composes music, designs a product, or proposes a new scientific theory, takes all kind of advantage of this public domain. However, this domain is under increasing attack. As a result, laws about copyrights and patents need to be extended. Of course, Boyle is far from being the first person to criticise this general line of thinking. However, what makes Boyle’s book stand out is the balance which he brings. 1. Drug patents do help produce drugs. Jettisoning them is a bad idea—though experimenting with additional and alternative methods of encouraging medical innovation is a very good one. In a number of respects, the politics of intellectual property and the public domain is at the stage that the American environmental movement was at in the 1950s. In 1950, there were people who cared strongly about issues we would now identify as “environmental”—supporters of the park system and birdwatchers, but also hunters and those who disdained chemical pesticides in growing their foods. In the world of intellectual property, we have start-up software engineers, libraries, appropriationist artists, parodists, biographers, and biotech researchers. In the 50s and 60s, we had flurries of outrage over particular crises—burning rivers, oil spills, dreadful smog. In the world of intellectual property, we have the kind of stories I have tried to tell here. Lacking, however, is a general framework, a perception of common interest in apparently disparate situations. Crudely speaking, the environmental movement was deeply influenced by two basic analytical frameworks. The first was the idea of ecology: the fragile, complex, and unpredictable interconnections between living systems. The second was the idea of welfare economics—the ways in which markets can fail to make activities internalize their full costs. The combination of the two ideas yielded a powerful and disturbing conclusion. Markets would routinely fail to make activities internalize their own costs, particularly their own environmental costs. This failure would, routinely, disrupt or destroy fragile ecological systems, with unpredictable, ugly, dangerous, and possibly irreparable consequences. These two types of analysis pointed to a general interest in environmental protection and thus helped to build a large constituency which supported governmental efforts to that end. The duck hunter’s preservation of wetlands as a species habitat turns out to have wider functions in the prevention of erosion and the maintenance of water quality. The decision to burn coal rather than natural gas for power generation may have impacts on everything from forests to fisheries. The attempt to reduce greenhouse gases and mitigate the damage from global warming cuts across every aspect of the economy. Of course, it would be silly to think that environmental policy was fueled only by ideas rather than more immediate desires. As William Ruckelshaus put it, “With air pollution there was, for example, a desire of the people living in Denver to see the mountains again. Similarly, the people living in Los Angeles had a desire to see one another.” Funnily enough, as with intellectual property, changes in communications technology also played a role. “In our living rooms in the middle sixties, black and white television went out and color television came in. We have only begun to understand some of the impacts of television on our lives, but certainly for the environmental movement it was a bonanza. A yellow outfall flowing into a blue river does not have anywhere near the impact on black and white television that it has on color television; neither does brown smog against a blue sky.” More importantly perhaps, the technologically fueled deluge of information, whether from weather satellites or computer models running on supercomputers, provided some of the evidence that—eventually—started to build a consensus around the seriousness of global warming. Despite the importance of these other factors, the ideas I mentioned—ecology and welfare economics—were extremely important for the environmental movement. They helped to provide its agenda, its rhetoric, and the perception of common interest underneath its coalition politics. Even more interestingly, for my purposes, those ideas—which began as inaccessible scientific or economic concepts, far from popular discourse—were brought into the mainstream of American politics. This did not happen easily or automatically. Popularizing complicated ideas is hard work. There were popular books, television discussions, documentaries on Love Canal or the California kelp beds, op-ed pieces in newspapers, and pontificating experts on TV. Environmental groups both shocking and staid played their part, through the dramatic theater of a Greenpeace protest or the tweedy respectability of the Audubon Society. Where once the idea of “the Environment” (as opposed to “my lake,” say) was seen as a mere abstraction, something that couldn’t stand against the concrete benefits brought by a particular piece of development, it came to be an abstraction with both the force of law and of popular interest behind it. To me, this suggests a strategy for the future of the politics of intellectual property, a way to save our eroding public domain. How important are these issues? 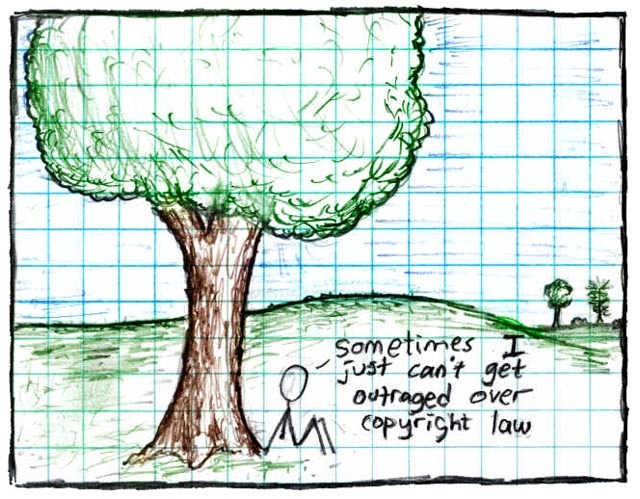 We can all laugh at the famous xkcd stick figure cartoon lamenting “sometimes I just can’t get outraged over copyright law”. Who can blame the stick figure? Certainly not I. Is it not silly to equate the protection of the environment with the protection of the public domain? After all, one is the struggle to save a planetary ecology and the other is just some silly argument about legal rules and culture and science. I would be the first to yield primacy to the environmental challenges we are facing. Mass extinction events are to be avoided, particularly if they involve you personally. Yet my willingness to minimize the importance of the rules that determine who owns science and culture goes only so far. A better intellectual property system will not save the planet. On the other hand, one of the most promising sets of tools for building biofuels comes from synthetic biology. Ask some of the leading scientists in that field why they devoted their precious time to trying to work out a system that would offer the valuable incentives that patents provide while leaving a commons of “biobricks” open to all for future development. I worry about these rules naturally; they were forced to do so. A better intellectual property system certainly will not end world hunger. Still it is interesting to read about the lengthy struggles to clear the multiple, overlapping patents on GoldenRice—a rice grain genetically engineered to cure vitamin deficiencies that nearly perished in a thicket of blurrily overlapping rights. Boyle’s book is a great contribution to the cause of finding the best “sweet spot” balance between intellectual property and the public domain. It deserves to be very widely read. Footnote: Many thanks to Martin Budden for drawing my attention to this book.